This fall will mark the tenth anniversary season of Alameda’s Live @ the Library concert series. 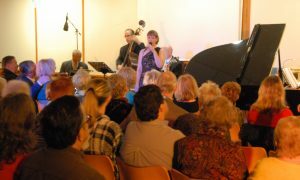 This highly successful set of events brings well-known musical artists to the Alameda Main Library for three separate concerts, usually held in September, October and November. New volunteers are needed to help both plan and staff the event. New volunteers will learn the ropes from veteran committee members during the fall 2018 concert series so they’ll be ready to take full responsibility in 2019.
video coverage of the concerts. Time commitment: June to November. designer and printer on posters, banners and direct mail. Time commitment: June to November. • Raffle chair: Solicit raffle items, publicize, sell tickets. If you’re interested in helping out, contact FAL by email at info@alamedafriends.com.